Hello my name is Jill Hughes. I feel very privileged to have been elected chair of governors once more for this new academic year and to be working with such a professional team of staff and governors. I would also very much like to thank the outgoing chair Rachael Downs for all her hard work and dedication over the last year. Making sure that everyone, including yourselves, is clear about the school’s vision for your children and how the school plans to realise the vision. Working with the Head Teacher to ensure that your children do the best they can and that all the staff are supported and trained, to work with them to the best of their ability. Making sure the funding is well spent, by seeking value for money and targeting resources to areas that will best help your children achieve their full potential. To enable us to carry out our work we have three committees, these are – Pay and Staffing, Finance, Premises and Safeguarding, Curriculum, Standards and Inclusion. The two main committees meet each half term, with members of staff, to monitor and discuss the progress of the School Development Plan and report back to all the governors, via a full Governing Body Meeting, again held every half term. We also try and visit school as often as possible to see for ourselves how well the school is functioning. We do this by attending some staff training, observing lessons, being involved in workshops and assemblies and attending parent’s evenings. The governors come from a range of backgrounds and have different skills, but we could not do our job without the expertise of the Head Teacher, Leadership Team, Staff Governors and all the amazing staff at Bells Farm. In my other role as safeguarding governor, I have the responsibility with the Head Teacher, to ensure that all your children while in school, are as safe as they can possibly be. This as I’m sure you would agree, is vitally important and encompasses everything – administration, staffing, visitors, curriculum, activities, premises, outside visits and online safety. We all want to give your children the best possible chance in life to succeed and I believe with the right commitment from everyone, the governors, the staff and yourselves, we will forge a dynamic partnership that will enable this to happen. 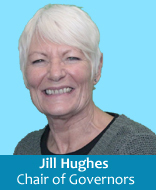 When you see me at the next school event, please come and say hello but if you would like to contact me before then, or any of my fellow governors – please do so by contacting me through the Head Teacher or the school office.